In Part 1 of this blog, I introduced the theory of a five-part winning combination to achieve amazing abs (cardio + weight training + abdominal exercises + diet + genetics), the dangers of not having a slim waistline, how your genetics play a role and why cardiovascular exercise is so important. In Part 2, I am going to discuss how weight training fits in, some of the best abdominal exercises for flat abs, an overview of what your diet should look like, and some final go get ’em tips! 3) Weight Training. Most men and women tend to lose muscle mass with age due to inactivity, causing a slower metabolism. But the more muscle mass you have on your body, the more fat you will burn on a daily basis – regardless of your age. So building and maintaining your muscle mass is also very important in achieving and retaining your abs. With an ongoing, regular strength-training program using weights (30-45 minutes, three to four times a week), loss of your muscle tissue can be prevented and carved abs can be achieved. This can be accomplished with circuit training or free weights. If you need to, start with lighter lights and higher repetitions and work your way heavier and stronger. 4) Abdominal Exercises. There are three main muscle groups in your abdominals:rectus abdominis, transversus abdominis, and the internal and external obliques. These muscles are the only group that can be worked daily, and I highly recommend it. Even if it’s just for 15 minutes a day, do it since working these muscles regularly and consistently is key in achieving great abs. Seven great abdominal exercises are: 1) Sit ups with a dumbbell or medicine ball for that extra push; 2) Leg raises from the floor, bench or in a captain’s chair; 3) Stomach crunches on a mat or on an exercise ball; 4) Vertical leg crunches on the floor; 5) Reverse stomach crunches on a mat or bench; 6) Planks on your elbows with both planted toes or one raised leg; and 7) Bicycle peddle from your back and on a mat. Also, both yoga and Pilates are excellent for your abs as they focus on strengthening your core. 5) Diet. Your diet is another clincher in all of this mad methodology. To have great abs, you have to get rid of the extra layers of fat hiding them as excess food tends to accumulate around the middle. Start by cutting out the wrong foods and eating the right ones in small meals throughout the day. Eliminate all of the sugars from your diet and avoid foods containing simple and complex carbohydrates. This includes most whites, such as bread, pasta, chips, fries, and saturated fats. These calories go right to your waistline. Stay away from alcohol and soda, skip all junk food and pass up on foods with a high salt content that cause water retention. Steer clear of gassy foods that can cause bloating, including wheat, bananas, broccoli and many others. Some of the good foods to eat include those high in protein like tuna, salmon, eggs and foods that are high in fiber like fruits, vegetables, whole grains. While dairy is high in fat and should be limited when going for the six pack, eating a daily serving of a probiotic-rich food like yogurt helps your digestive system to break down your food, preventing potential gastrointestinal issues that can keep you from having a flat stomach. Also, drink plenty of water, which should always be your first beverage of choice. Six to eight 8-ounce glasses of water is ideal. If you are dehydrated, your body retains water in retaliation and you may end up with extra excess pounds around your middle. Some final tips: Remember, there is no way to target fat loss just in your stomach area, but your exercising and dieting will help do the trick. 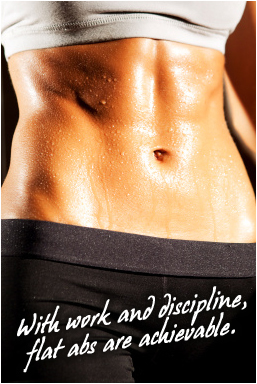 To get started on your sculpted abs, you will need to do two things – build muscle and lose fat. If you feel you have hit a plateau, change up your exercise and cardio and switch up your diet. When eating, chew each bite at least 10 times before swallowing. If you eat fast, you are more likely to swallowing air, which also can deposit around your middle. Lastly, make sure you get a good night’s rest of 7-8 hours of sleep as lack of sleep increases the likelihood you will gain weight.